This layout shows a typical Biology Lab using two Sheldon Trifacial Service Islands with “wing” tables. 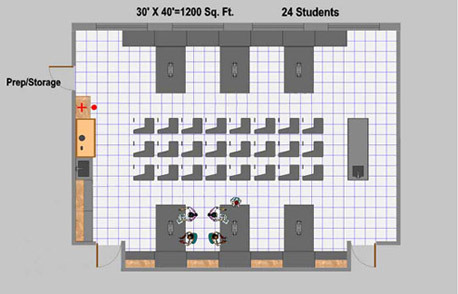 The lab is 30′ x 40′ and will accommodate 24 students. Other features in the lab include: perimeter casework, two RinseAway Sink Stations and a teacher demonstration desk. This layout shows a typical Chemistry Lab using six Sheldon TE II tables. 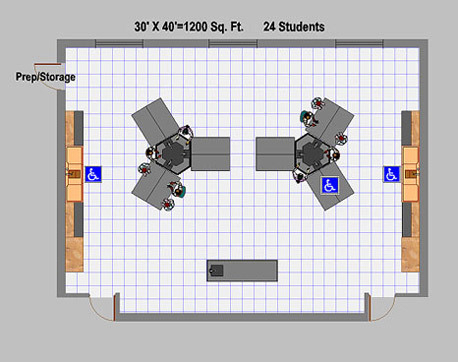 The lab is 30′ x 40′ and will accommodate 24 students. Other features in the lab include: perimeter casework, a fume hood, a teacher demonstration desk and 24 student desks. Sheldon Laboratory Systems is a Registered Provider with the American Institute of Architects Continuing Education Systems. The program is registered with the AIA/CES for continuing professional education. The AIA presentation qualifies for one LU(learning unit) and Health, Safety and Welfare(HSW) credit. Please contact sales@sheldonlabs.com to schedule an AIA presentation. For more than a century we have tracked the developments and trends in education and adapted our plans to new standards and ideas. These days, STEM (science, technology, engineering and math) education is a very important focus for all schools. When it comes to planning and designing school science labs and STEM classrooms, Sheldon pioneered the field. For grades K-12, colleges and universities, and for research facilities, we can craft a plan to help you and your clients make the most of your available space. Using NSTA guidelines, we ensure form, function and attractive design work together for the lab that best suits your purposes. Whether your project involves new construction or renovations and upgrades, Sheldon Laboratory Systems can help design and furnish the perfect STEM learning environment. This service is free to our customers and dealers. Our sales-planning department is available to assist you in planning your facility for the most efficient use of your space, personnel, funds and other resources to provide you with a “functionally correct” lab space. We are available to assist architects in providing lab layouts and design, specifications and budget pricing. This layout shows a typical Multi-Science Lab using six Sheldon Pier tables. 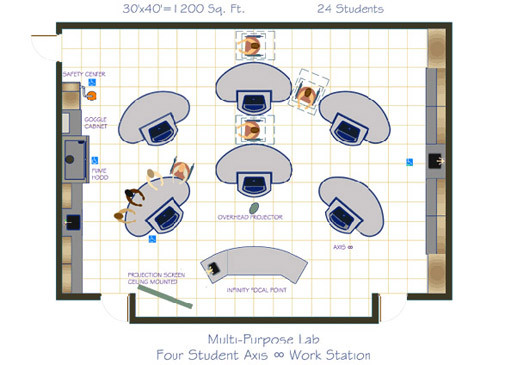 The lab is 30′ x 40′ and will accommodate 24 students. Other features in the lab include: perimeter casework, a fume hood, a teacher demonstration desk and 24 student desks. This layout shows a typical Multi-Science Lab using six Sheldon Axis Infinity tables. 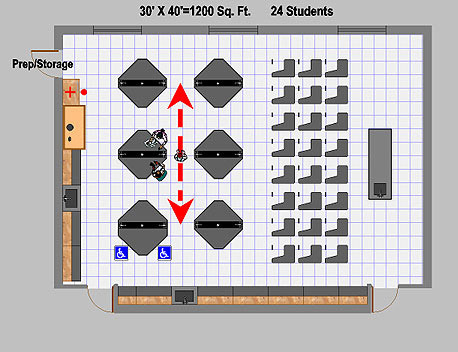 The lab is 30′ x 40′ and will accommodate 24 students. Other features in the lab include: perimeter casework, safety center, fume hood, a Sheldon Focal Point Teacher Demonstration Desk (to store a DVD Player, Elmo, Flex Cam and Laser Disc Player, Computer and Computer Printers), a ceiling-mounted LCD projector and a ceiling-mounted projection screen.